The new Edelbrock E-Force Supercharger System for the S197 Ford Mustang 4.6L 3V will allow you to boost your Pony to a very impressive 466 horsepower and 439 ft./lbs. of torque. These kits feature a low profile to fit under the factory hood, fifteen inch long runners for low end torque, low boost pressure minimizes engine stress, and low air restriction through the supercharger. All of this adds up to the largest possible gain in horsepower while maintaining safe operation on a factory engine. The core of the supercharger system is the all new Eaton Gen VI TVS Supercharger rotating assembly. Eaton's assembly features a four lobe design with 160° of twist for maximum flow, minimum temperature rise and quiet operation for excellent drivability. The supercharger assembly has been integrated into the intake manifold for a seamless design with minimal components, eliminating the possibility of vacuum leaks between a gasket surface. Edelbrock's unique inverted supercharger assembly is placed low in the valley, allowing for an incredible industry leading 15" of intake runner length for maximizing low end torque. An integrated bypass valve helps eliminate parasitic loss under light throttle for improved mileage potential. 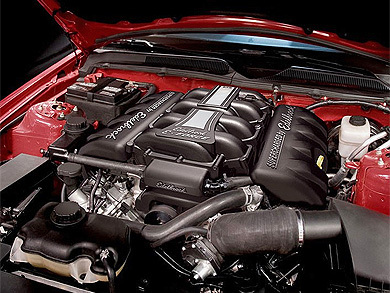 The supercharger system breathes through a specially engineered 85mm electronic throttle body matched with the most unique and efficient inlet configuration on the market. This combination results in a shorter less restrictive intake path for improved air flow, eliminating the need for a jack-shaft. Keeping the air cool is a 110 square inch high capacity air to water intercooler and dual core low temp heat exchanger. This intercooler is the largest available on the market today. 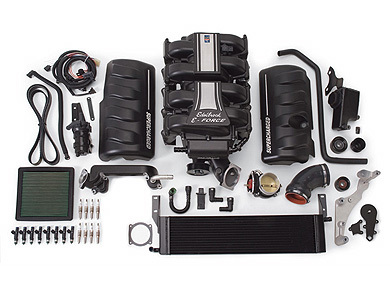 Finally.. the Edelbrock E-Force Supercharger system is not just a performance upgrade, it also has great looks! The supercharger assembly and matching coil covers are uniquely styled to give your engine compartment a custom look. All of these components have been black powdered coated for durability with highlighted fins and Edelbrock logo for a timeless look. Complete package includes supercharger/intake assembly, air inlet with 85mm throttle body, fuel injectors, air-to-water intercooler and spark plugs. Made in the USA for absolute quality and performance! NOTE: Vechicle tuning required for a complete installation (not included).